Sorry I've been so quiet everyone but I've had a lot of stuff going on. Anyways a little while ago myself and Vicky decided since she can't get some of the brands she loves from Ireland over in the UK and some UK brands are not available here in Ireland for me we decided we would do a beauty swap. And I have to say Vicky picked out some amazing stuff for me. I was so delighted about the Sleek Rose Gold blush seen above the purple Dainty Doll shadow and below the MUA blush, I'd read so mush about this blush online that's I'd been lusting over it forever and now I finally have it thanks to Vicky! I've tried most of the products now but I want to use them all a little while longer before doing some reviews. 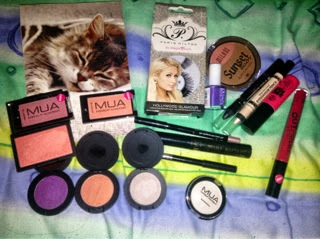 I also hope to do some videos on my YouTube channel creating some looks with these products so keep an eye out for them.